The recent release of Resident Evil 4 HD reminded us that some great games remain as inviting and playable as they ever were, even after the passage of several years and countless innovations within the same genre. If only the same could be said about tomorrow's release of Resident Evil: Code: Veronica X HD. Almost twelve years after its first appearance on the Sega Dreamcast, playing Code: Veronica X feels more like fumbling through an interactive museum exhibit demonstrating some of 3D gaming's first wobbly steps into modernity. It's still a solid game, but you should leave behind most modern conceptions of what makes a good game if you want to get the most out of this outing. Despite its ambitious HD moniker, Code: Veronica X is little more than a glorified port of the 2001 "director's cut" of sorts for the PlayStation 2, which added around ten minutes of new cutscenes, some minor graphical updates and plot options, and a snazzy "X" for the title. But don't expect that level of improvement here. This is still classic RE in all of its puzzle-laden, fixed-camera goodness, which means that you're ultimately dealing with the finest incarnation of the framework that Capcom felt compelled to toss out for Resident Evil 4. The addition of dynamic shadows, admirable water effects, and clearly updated menu options indicates that Capcom took the game's "HD" moniker a little more seriously for this entry, but the standard visuals usually follow RE4's lead in simply sharpening existing textures for high-definition screens. For the most part, it works well enough. The only glaring exceptions, the cutscenes, are so jarringly pixelated that it's worth wondering if they gave them any attention at all. The ramped-up visuals are enough to label this outing the best looking version of the title to date, yet the razor-sharp edges make it hard to shake the realization that games from this period embraced softer textures in an effort to mask the limitations of the contemporary three-dimensional technology. The story is still as engaging as ever, even with the cornball dialogue and voice acting. Three months have passed since the little mishap at Raccoon City in Resident Evil 2, and the spunky Claire Redfield kicks off the action while she tries to escape an island prison operated by the dastardly Umbrella Corporation. Once you've seen Claire pump a few hundred rounds into zombies, worms, and other assorted freaks, you'll then spend time as Claire's brother Chris as he revisits much of the same scenery in an attempt to save his sister. Keeping up with the Redfields still feels suspenseful owing to the fantastic sense of foreboding that attends the opening of every door. If for no other reason, you should play Code Veronica X to experience the atmosphere 3D games can achieve when graphical prowess takes a back seat to tension. Part of that tension arises from the awkwardness of simply moving Claire and Chris around the landscape. The controls were clunky even by the standards of the year 2000, but they feel downright maddening now. You'll likely spend the first thirty minutes or so bobbing and bumping around like a zombie yourself before you figure out how to perform simple tasks such as walking up four steps. It's worse when you enter combat. Claire and Chris can only fire up, down, and straight ahead, and the wonky camera and imprecise auto-aim ensure that you'll sometimes struggle to unload buckshot into a zombie only five feet in front of you. If that's not enough to fray your nerves, you might grow weary of the endless backtracking in the first few hours, the overly long stair and door sequences that signal the entry into a new zone, and the game's insistence on forcing you to hunt down ink ribbons before you can save your game. But these are mainly modern concerns. Accept Code: Veronica X on its own terms, and it's still easy to see why so many of us spent hours fumbling with its many puzzles and hogging the console because we couldn’t find an ink ribbon. If you're new to the title, you might even enjoy hunting down the handful of achievements/trophies or unlocking the two additional playable characters. Just don't expect to slip into the gameplay as easily as you might have done with Resident Evil 4 HD. 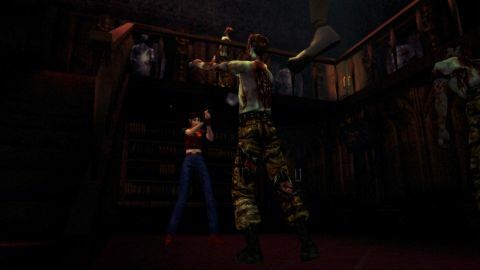 Code: Veronica X may provide many hours of zombie-killing fun, but they're difficult hours, and playing it requires accustoming yourself to the gameplay norms of an increasingly distant era. Indeed, it's probably best to think of playing Code: Veronica X as an experience akin to jumping in a cold swimming pool. Once you get used to it, it's not so bad. The only question, then, is whether such an experience is worth $20.